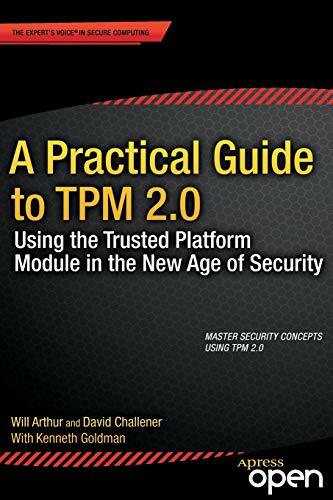 A Practical Guide to TPM 2.0: Using the Trusted Platform Module in the New Age of Security is a straight-forward primer for developers. It shows security and TPM concepts, demonstrating their use in real applications that the reader can try out. Simply put, this book is designed to empower and excite the programming community to go out and do cool things with the TPM. The approach is to ramp the reader up quickly and keep their interest.A Practical Guide to TPM 2.0: Using the Trusted Platform Module in the New Age of Security explains security concepts, describes the TPM 2.0 architecture, and provides code and pseudo-code examples in parallel, from very simple concepts and code to highly complex concepts and pseudo-code. The book includes instructions for the available execution environments and real code examples to get readers up and talking to the TPM quickly. The authors then help the users expand on that with pseudo-code descriptions of useful applications using the TPM. Will Arthur is a server TXT architect and lead developer for Intel Corporation; currently developing TSS 2.0 system API specification and code; participant in TCG TPM 2.0 readability sub group, TPM workgroup, and TSS workgroup. He has a BS in Computer Science from Arizona State University and has worked in the embedded firmware, BIOS and low level software space for over 25 years.